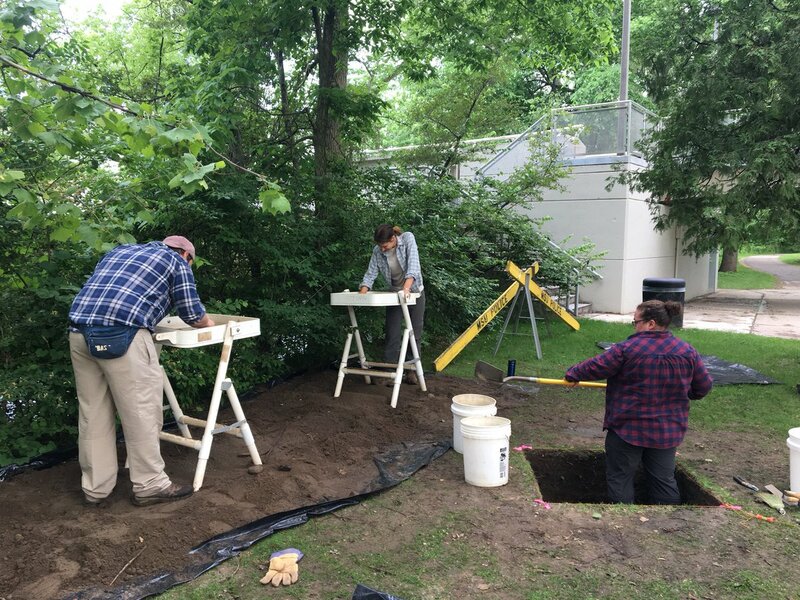 This summer was an eventful one for the Campus Archaeology Program field crew! We monitored construction, conducted several pedestrian and shovel test surveys, excavated one test unit, conducted lab analysis, and helped with the IB STEM archaeology camp and grandparents university. Plus, we uncovered an entire cow skeleton! Below you can read in more detail about each project. October 1953 aerial image of Toolan home lot, Hagadorn Road located just outside of the image to the right. Note the main house on the left, as well as the presence of one or two smaller outbuildings to the right of the main home. Image Source. With the Wilson Road construction beginning, we continued our pedestrian and shovel test survey previously started in 2017, focusing this summer on the Shaw/Hagadorn intersection. From archival research, we learned that the Toolan and Biebeshiemer families occupied the area since the mid-1800s, before MSU purchased the property. 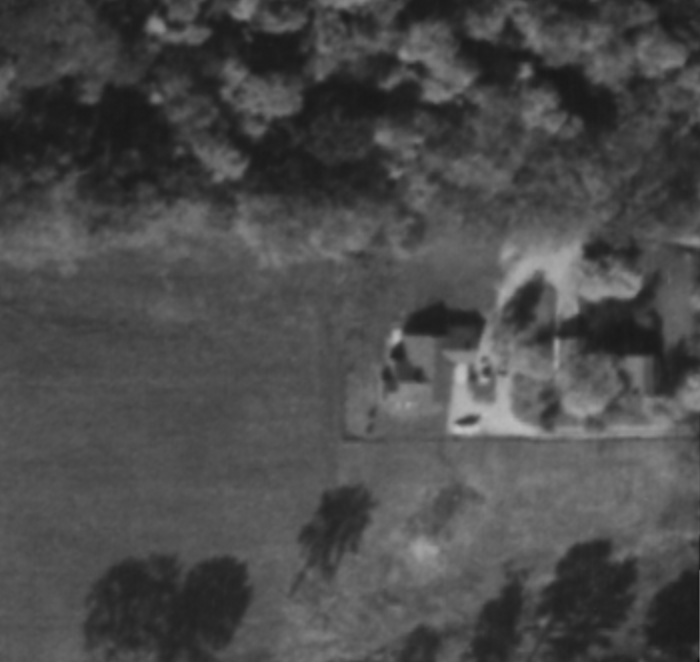 Based on aerial photos, it appears that the Toolan family had a home located near the current basketball court today, however, no structures from the Biebeshiemer property appear in this area (they were located farther south). Artifacts from a shovel test unit within the Shaw/Hagadorn survey area. Locations of artifact concentrations (highlighted in blue) located during CAP pedestrian survey and metal detector survey. 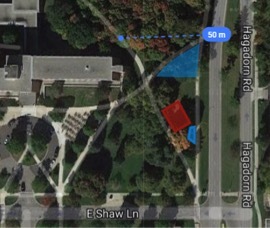 Current basketball court highlighted in red. During both pedestrian and shovel test surveys in this area, a higher concentration of artifacts was found in the northern portion of the project area. Based on aerial photographs, this concentration of material is located at the northern border of the Toolan home, where the yard gave way to forest. Shovel tests recovered square cut nails, wire cut nails, window glass, milk glass, vessel glass of various colors, slag, white ware, mortar, brick fragments, various metal objects, and butchered faunal remains! You can read more about this excavation in our field report that will be published on our website later this semester. Throughout the summer, we continually monitored the ongoing construction for the Wilson Road realignment. While most of the monitoring was uneventful, we did have one very exciting find, an entire cow skeleton! 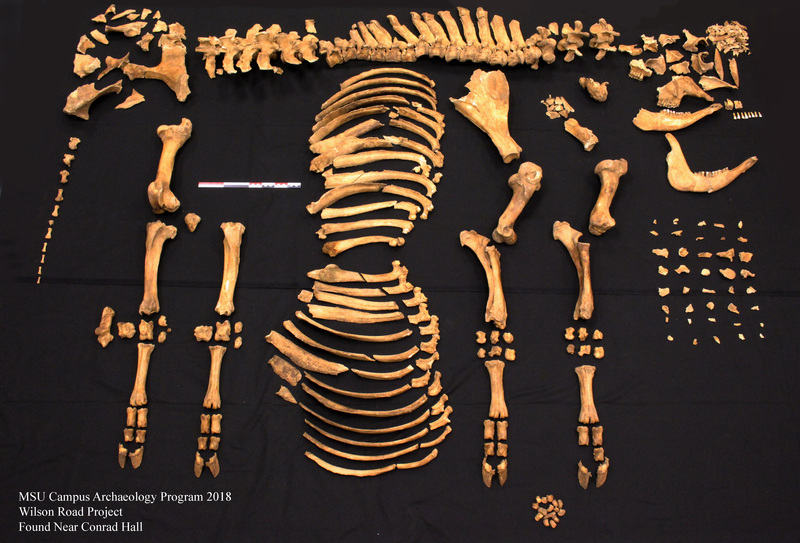 Image shows the skeletal elements of the cow recovered from the Wilson Road construction. The construction crew was excavating a trench to the west of Conrad Hall and uncovered some large animal bones. Based on its worn teeth, this cow was older at death, and we are currently working on determining a more precise age. 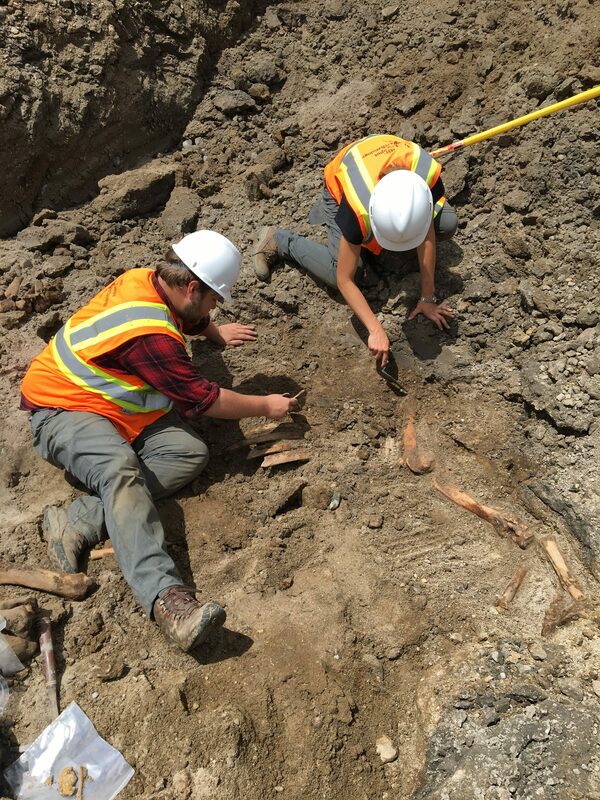 CAP crew members carefully excavating the cow skeleton recovered from the Wilson Road construction. During excavation, we also found what we believe to be stomach contents. The field crew collected several samples and is collaborating with Frank Telewski to see if the plant material can be identified. Stay tuned for an update! We also discovered that the right side of the cow had the ribs sawed in half, but were still found articulated in the correct anatomical position during excavation. The exact reason for this is still unknown, so if anyone had any ideas, please comment or send us an email! CAP field crew excavating the 1×1 meter unit along the north bank of the Red Cedar River. In the late winter of 2018, Michigan State University’s campus was impacted by severe flooding caused by heavy rain and snow melt. Peaking at just over 10 feet, it was the worst flooding event on the campus in over 4 decades! 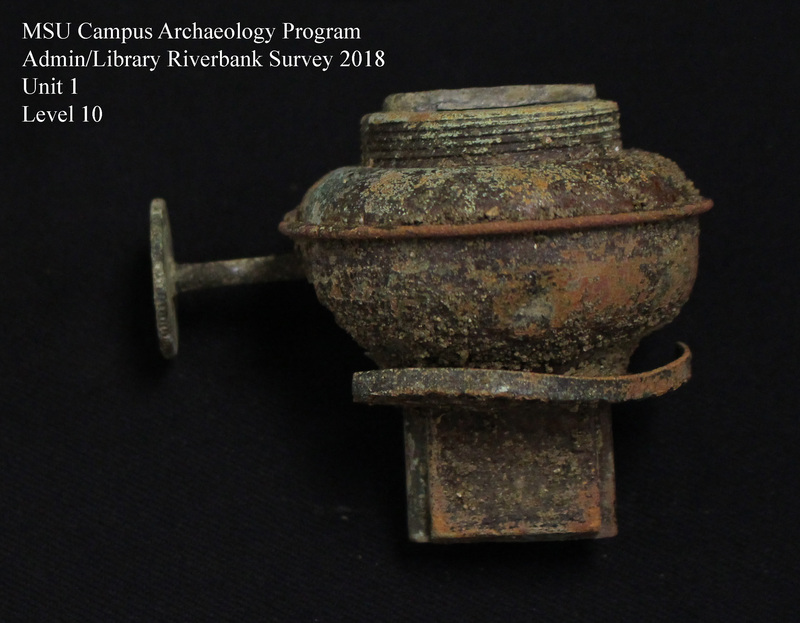 You may remember that in order to assess any damage or exposure to these known sites, former Campus Archaeologist Lisa Bright initiated an informal survey of the northern bank of the Red Cedar River in the spring of 2018. During this survey, erosional damage to one known archaeological site and a larger scatter of artifacts from an unknown deposit were discovered. In response to this, the summer 2018 Campus Archaeology field crew re-visited this area to conduct a more intensive, systematic survey of these deposits. Top view of the 1×1 meter unit along the north riverbank near the library. We did both a pedestrian and shovel test survey, followed by a 1×1 meter test unit. During the pedestrian survey, one continuous erosional surface was located. It appears that this erosional surface, created by the spring flood, was the origin point for most of the artifacts located during the survey. We then completed 20 shovel test excavations on the north side of the river from the Administration building to the Library. Through these shovel tests, we uncovered evidence of the railroad that ran through the area to a powerplant that used to be located where the Adminstration building stands today. We also found a high concentration of trash debris in one area, sparking our interest! 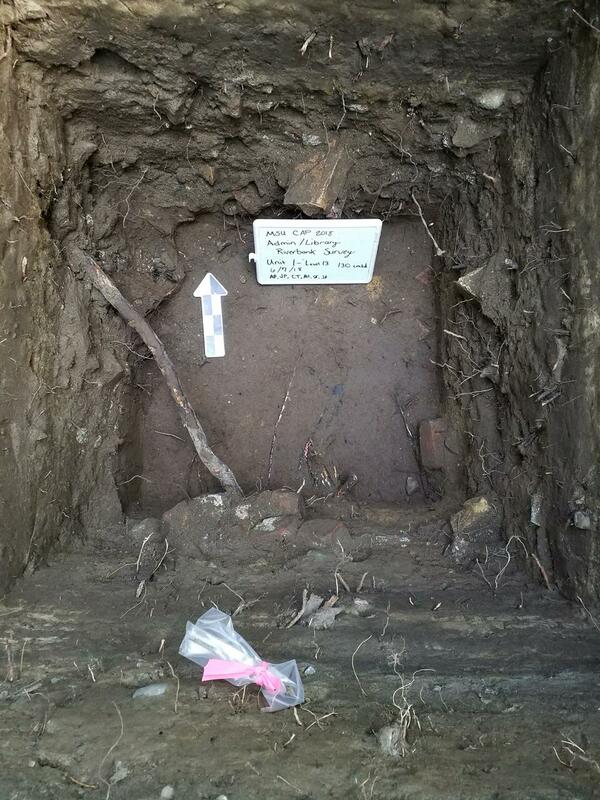 We opened up a 1 x 1 meter excavation unit to get a better understanding of this deposit. Within the unit we found many different types artifacts, including various kinds of glass and ceramic fragments; building debris including bricks, nails, and wire; and some more unusual artifacts including a door keyhole and a kerosene lamp fixture. You will be able to learn more in the upcoming field report that will be published this semester. Image shows artifacts from level 10 uncovered in the 1×1 m unit on the north bank of the river. Image shows the metal kerosene lamb base uncovered in the 1×1 m unit on the north bank of the river. Grandparent’s University participants filling out survey cards on their space-based memories. This summer, Campus Archaeology again hosted a program for Grandparents University! We tried out our new archaeology site box kits that we developed for the Livonia Middle School in January. The main activity went very smoothly and we received very positive feedback on both the grandparents and grandchildren’s experience! 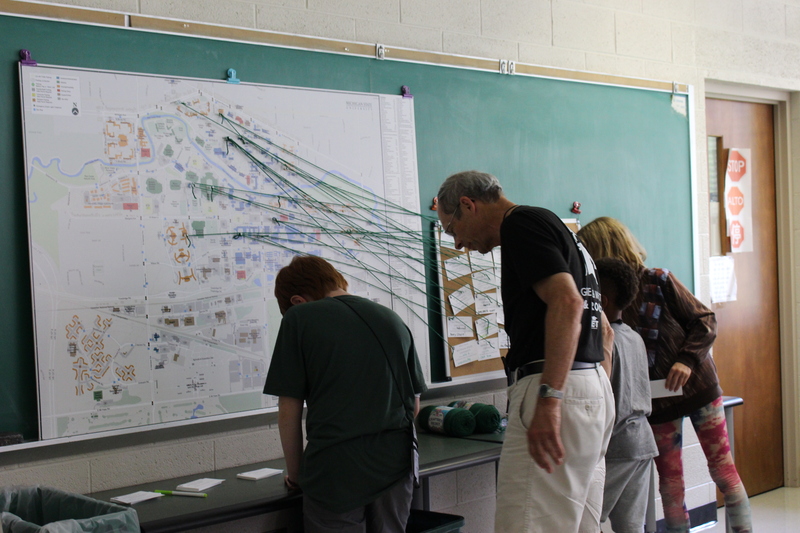 In addition to the site boxes we also had the grandchildren and grandparents fill out memory cards and pin them to an oversized map of campus to learn more about their memories related to space (image). It was a lot of fun to talk to the families and hear about their memories of campus and how so many of them were related to a specific place on campus. 2018 IB Archaeology STEM Camp participants excavating. The Campus Archaeology Program collaborated with several IB school teachers through a Science + Society @ State grant to develop a 2.5 day archaeology program. Fifteen students attended, staying overnight in the dorms. Both students and instructors had a great time, and we learned even more about the homestead that used to exist at the northwest corner of Shaw and Hagadorn. A more detailed discussion of this event, written by Dr. Stacey Camp, will be posted on our blog on World Teacher’s Day (October 5th), so keep an eye out!